Artisan, widescreen 1.85:1/16x9, languages: English DD 5.1 [CC], subtitles: none, single side-dual layer, 30 chapters, rated R, 94 min., $29.98, street date 2/1/2000. Directed by David Koepp. Starring Kevin Bacon, Kathryn Erbe, Illeana Douglas, Liza Weil, Kevin Dunn, Conor O'Farrell. 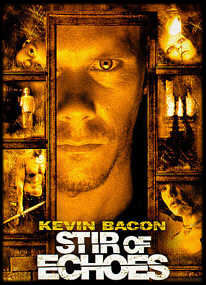 When Stir of Echoes opens, life in a working-class Chicago neighborhood is relatively quiet and simple for Tom Witzky (Kevin Bacon), his wife Maggie (Kathryn Erbe) and their young son, Jake (newcomer Zachary David Cope). Their ordinary existence, however, takes a frightening turn when a skeptical Tom agrees to let his sister-in-law, Lisa (Illeana Douglas), hypnotize him during a neighborhood party. That session gives Tom far more than he bargained for. While "under," he sees brief flashes of brutal images before awakening in a cold sweat-never to be the same. His attempts to rid himself of the visions, including a second, even more disturbing, hypnotic session, only draw him further into a supernatural mystery. Tom's hypnotic experiences spark a subconscious awareness he can't begin to understand: a strange ability to "hear" and "see" sensations from that supernatural, "other" world he won't even concede exists. In the days that follow, he finds himself haunted by more nightmares and disturbing images, makes a surprising discovery about his son, and inevitably comes face-to-face with what appears to be a tormented, ghostly visitor. As the visions continue, Tom's behavior grows frightening and erratic, and he begins to distance himself from everyday life. Instead, he immerses himself totally in solving the mystery that is beginning to envelop him. Initially unable to understand why the supernatural presence has singled him out, Tom eventually becomes convinced it is trying to tell him something. He doggedly pursues the meaning of the ghostly pleas tormenting him, and eventually makes a grisly discovery in his own home-a discovery that could destroy his marriage, his life and the entire Chicago neighborhood where he lives. That discovery finally leads Tom to understand that some secrets refuse to stay hidden and buried. He therefore forges ahead with a clear conviction that he must act to right a cruel wrong at all costs. As the film races to a stirring and unforgettable conclusion, he struggles to answer a faint, haunting cry for justice, one that appears to originate from beyond the grave. As most people noticed, this past year was the re-birth of the true ghost story. I was getting sick of all those Scream rip-offs, slashers chasing them, not one girl able to think of how to get away (obviously all mental power going to the development of other parts of their bodies) and then the movie trying to be a self parody when all it would do is fall into its own clichés that it's trying to make fun of. I love the ghost story and got my share this year. I only liked two, true. Out of all the ones last year only The Sixth Sense and Stir of Echoes really fired my imaginations and creeped me out. The Haunting was just an expensive trash, its over budgeted special effects were more unintentionally funny than scary. Blair Witch had a wonderful idea but going in my backyard is much scarier than that movie ever would be (to me anyway). The House On Haunted Hill was equally trash, but it knew it was and never tried to elevate beyond a few good shocks. I still consider The Sixth Sense the best of the five I saw but Stir of Echoes is very close behind. The Sixth Sense had better atmosphere and a great ending. Echoes is faster paced but its ending is a bit of a letdown. Otherwise this is a very spooky, well-crafted horror flick. David Koepp, getting away from writing such rubbish like Snake Eyes, directs and adapts Richard Matheson's novel very well to the screen. Kevin Bacon plays Tom Witzky, a lowly telephone cable stripper. When we first meet him he is very down on himself. While he seems content with his life, he just never planned on being so "ordinary." That changes when his wife's sister (Illeana Douglas) hypnotizes him at a little party. Afterwards he begins to see flashes of something. What? You never really get to see. A young girl appears, seeming to ask for help but Tom can never make out what it is. He becomes obsessed with this, never going to work, digging (literally) for clues. The movie is quite creepy and has a great effect. The movie is not gory, but the flashes of horror being shown are good enough. The creepy sound effects actually work as well, and not just noise. The problem is that it only works during the first viewing. The Sixth Sense works on numerous viewings (it of course loses its effect after a while too). Since we never know what Tom is really seeing, it leaves so much to the imagination, which is usually scarier than whatever could be shown on screen. Once we know, though, the atmosphere is gone on repeat viewings. While SS is the same way, it knew how to handle the mood. Koepp doesn't really have that knack. Still, the first viewing works quite well. The ending though is quite a big letdown. We have all these tantalizing ghost scenes and scenarios and the mystery begins unfold by bits and pieces and then we get a showdown that does not justify the mean of getting there. You also have that tiring old trick of someone coming in just the nick of time. I found this very annoying to a movie that was working quite well up to this point. Artisan is a company I'm not too familiar with in the realm of DVD, I have only seen their Suicide Kings DVD and that's it. I was impressed with that one, though. And they did an expedient job on the DVD for Stir of Echoes. The disc is presented on a single-sided, dual-layered disc. The image is presented in an aspect ratio of approximately 1.85:1 and is enhanced for widescreen TVs. Just to clear up something, there's some confusion on the package which stated "16x9 fullscreen version," but what it meant is that on a widescreen set, the image would convert to fit the entire screen. In actuality only the widescreen is offered and not the standard 1.33:1. The label is rather misleading. The image is decent but suffers from a lot of problems that would have occurred during the digital transfer. Jagged edges appear constantly. It became quite annoying. Building edges, round objects, just about anything has a jagged edge. Not there all the time but it never really takes a break. Shimmering and moiré effects appear quite a bit as well. Print flaws are evident but not as often as the other problems. The picture is sharp and bright, though. Everything is well saturated, bright colours appearing very bright and dark colours are still easy to differentiate. Black levels are very good, a plus since the movie is pretty dark. Sharpness is a true virtue but I think that is what caused the jagged bits. The transfer is above average, but nothing to scream about. I really enjoyed the Dolby Surround 5.1 track. While I guess it's not the best one out there, man, it has a great spooky atmosphere. Dialogue is contained to the front, panning very nicely, it's very intelligible and never harsh or too quiet. Music and sound effects use up the whole soundstage quite nicely. What really did it were those low key eerie sound effects. They pan wonderfully from front to back and the extra .1 channel kicks in once in a while. It doesn't get a full workout and probably not one that will be demo worthy, but for this film it's perfect. We get a few supplements. The biggest one is the commentary by Koepp. I put off listening to it. I'm glad I review for this site or I would have missed it. I'm not big on commentaries but I really enjoyed this one. Koepp begins on discovering the book and then just goes on and on and on, covering everything that you could want to know. He seems to also hate digital effects in horror films and understands it's the simplest things that can creep people out. He explains how Brian DePalma helped him on his directing (he even went as far as calling DePalma one of the greatest 70's directors). It's actually a very humorous track as well. He never boasts that he is making a great film. He points out where he grabbed ideas from other movies ("some people call it stealing, I call it 'homage'"). Interestingly, he mentioned an improvement on the DVD involving Bacon's dream sequence, so I'm guessing this scene is supposed to look slightly different than in the theater but I didn't notice. I even liked him pointing out mistakes. Yep, he admits to it and jokes around a bit. I wasn't expecting much but he was very good with the track. There's a featurette that runs about 2 minutes. Basically, it is an over-glorified commercial. The "Behind-the-Scenes" bit is much better. It's exactly as it is stated. A behind the scenes look. It's footage of someone filming the set as the movie was being filmed. There is no narrator and we just watch everyone do his or her thing. I liked it. A music video is also included. It's of a song called "Breathe" by a Canadian band called Moist so if you don't know them, it's okay. This is one of their better songs but that isn't saying much since I don't really like them. I wish they included any version of "Painted Black" but beggars can't be choosers. You then get all those standard bonus. An okay theatrical trailer, 4 better TV spots, production notes and cast and crew bios. There are quite a few bios and they each run a couple pages. This isn't a very extensive DVD, but there's enough on it. A real annoyance though is the menu. Its opening went on a little too long for me. The film is rather creepy and offers better chills than other bigger hyped ghost stories. Yeah, it borrows from every other horror film but it mixes all the elements quite nicely. I can recommend the DVD for the film as well as the supplements and sound. The picture on another hand could have been better. Official Site--Besides having all the requisite movie info, the site also introduces a brief history of hypnosis, famous hauntings, esp test, mind opening exercises, postcards, and more. James Berardinelli's ReelViews--"The kind of film that may give you pause the next time you walk into a dark room by yourself." Roger Ebert--"Kevin Bacon stars in one of his best performances." Mr. Showbiz Celebrities: Kevin Bacon--An excellent source for profile and credits. Amazon.com--Available to purchase are the DVD at special discount, the novel by Richard Matheson, and the original music soundtrack featuring various artists.